Many parents are concerned about the presence of Bisphenol-A (BPA) in plastic baby bottles and sippy cups. Previously, we have written several posts on the subject, as the potential negative effects of this endocrine-disrupting hormone found in many plastics is alarming . Finally, there is one site parents can go to for a complete picture of BPA and children’s beverage containers: Z Recommends. Bloggers Jeremiah and Jennifer McNichols have completed the most thorough and comprehensive directory of BPA in baby bottles and sippy cups. Consisting of 25 individual posts, the Z Report recommends “Top Picks”, “Promising Entrants”, “Proceed with Caution”, and “Brands to Avoid.” There are individual posts for each company, as well. As Jeremiah explains, “The chart assesses the companies overall – for example, we are recommending avoiding companies that DO have a few BPA-free items, because their policies are inconsistent, they are strongly pro-polycarbonate, or they do not offer a non-polycarbonate bottle (even though they may have non-BPA sippys). We tried to give a broad picture of which companies are worth doing business with based on their BPA stance, and then have the company-specific pages to provide per-product information. 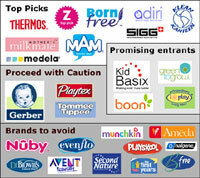 All Top Pick companies make only BPA-free products.” Z Recs’ goal is to have all companies disclose on their labels exactly what kinds of plastics are used on products that come into contact with children’s mouths. This sure would help consumers make wise decisions in the store, but for now, visiting The Z Report: A Directory of Bisphenol-A In Baby Bottles and Sippy Cups will help parents make sense of BPA in children’s products.
. I have just purchased a new adaptor top for one of our three Klean Kanteen sippys, as one broke when I dropped it on the floor. I like being able to purchase replacement parts for our Klean Kanteens, as it extends the life of the product, which of course is better for our environment. We have not experienced the leaking problems some parents complain about, but I also think a slow leak is a good thing for teaching toddlers to keep their cups right side up. I learned a lot about this company from Z Recs’ report on Klean Kanteen, including the fact that the company financed a commune in Chico, CA. I just read on a website that Klean Kanteen – Made in China (1$ per bottle donated to two organisations supporting Tibet). Great and informative post – and very organized blog! The Sippy Cups are great but what about the littler babies who need a safe water bottle? I have assembled these Kanteens with all the safe Avent spouts. These cups now work for all ages – from Newborn up to Toddler. The leaking problem also has been solved with these Spout Covers. The Sippy Cups do leak a bit but that is now not an issue with a Spout Cover. My company provides Spout Covers that fit right over the Sippy spouts.